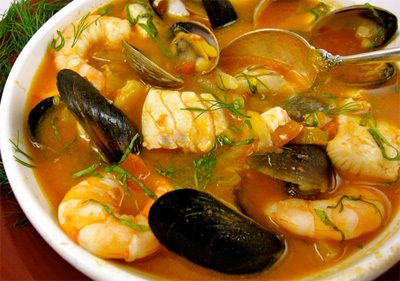 ﻿ Curried Shellfish Stew - Merwanjee Poonjiajee & Sons Pvt. Ltd.
Heat butter over medium high heat in a large stainless pot. Cook onions until dark brown, stir occasionally. Add curry, garlic & red pepper, cook for 1 minute. Whisk in vermouth, broth & lemon juice. Add Tabasco & chutney & simmer for 3 minutes. Add mussels, scallops, shrimp & water chestnuts. Cover & cook for 5 minutes until fish is cooked thoroughly. Remove pot from heat, stir in snow peas.